The Ulster Museum is running its first ever sleepover on Friday 28 January, starting at 7pm and finishing at 9.30am on Saturday morning before the museum opens again to the public. It's a new concept for Belfast, but one that's been about in other museums for some time. London's Natural History Museum had it's latest monthly sleepover - Dino Snores - this weekend. Have you ever wondered what happens when the visitors leave the Ulster Museum for the night? Does the Edmontosaurus rise and roar over Takabuti the mummy and does Peter the Polar Bear plod up to take a sneaky peek at the pottery and paintings? 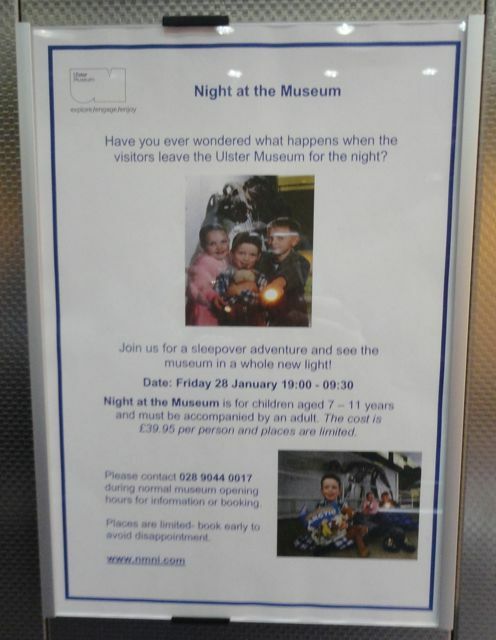 Open to 7-11 year olds (P4-P7), with a minimum ratio of one adult per five children, nocturnal visitors should expect their night-time adventure to include a torch-lit tour of the museum and craft activities before settling down to sleep. The cost is £39.95 per place and booking is via 028 9044 0017 during normal museum opening hours. The Ulster Museum is also running a competition for free places on its website. Sounds like something my 10 year old would love!! must look into it.